Here are the winners of the Nauvoo Family Vacation Drawing. 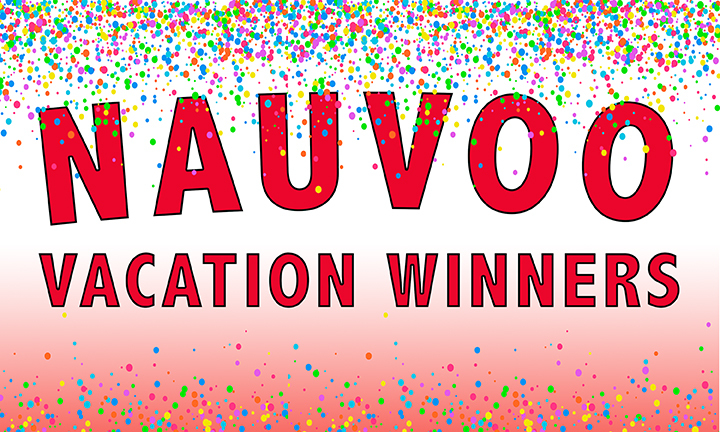 We are so thrilled to announce the winners of the Nauvoo Family VacationDrawing. It was so popular and well received that we have decided to add more dates and give-aways so watch for them. 4 night stay in our 4 bedroom 2 bathroom family suite in beautiful Nauvoo during the pageant or you can choose any other time of year if you like from January 1st to Dec 31st 2019. This perfect family accommodation can sleep up to 12 people so invite your friends & family. 3 night stay in our 4 bedroom 2 bathroom family suite in beautiful Nauvoo any time of year from January 1st to Dec 31st 2019 excluding July & August. This perfect family accommodation can sleep up to 12 people so invite your friends & family. A $250 shopping spree at our Mercantile Gift Shop in Nauvoo or online at this website. We are always finding unique and fun things for our store & site making this is a fun prize. A $25 shopping spree at our Mercantile Gift Shop in Nauvoo or online at this website. We are always finding unique and fun things for our store & site making this is a fun prize.